Bad news, everyone! The Avengers 2 figures are out, so it's time to start peg-hunting again! Well of course it is. Would he really build a less powerful suit? It's not like computer engineers try to develop slower processors, do they? Forty-two previous armors, and they were all part of a curve graph reaching ever upward, upward, upward. So that bio is accurate, but it also tells us nothing about what we can expect from the film. No spoilers until next month, I guess! So, the reason this figure is just getting a mini-review on the blog instead of a real review is that this is just a repaint of the Iron Man 3 Mark 42 Marvel Legend, with a lot more red and a lot less gold - in other words, it's a more "Iron Man-y" colorscheme, fixing our major complaint about the IM3 suit. One thing this suit has in its favor over the Mark 42 is the head. The alternate head, more specifically. An alternate head with Tony Stark's face! We've had an unmasked Iron Man before (as a rare Walmart exclusive for Iron Man 2), but that was fully un-helmeted, while this one is the helmet with the faceplate flipped up. Very cool! He comes with the left leg of BAF Thanos, a big and chunky piece with a lot more detail than you might expect. It moves at the ankle, shin, and double-hinged knee, and is painted a dark blue with gold and silver accents. I'd rather get a Mark 7 armor, which has still never been made in the 6" scale - for those keeping track at home, that's the suit that appeared in Avengers, so better to get this figure now than wait until Avengers 3: I Still Know What You Avenged Last Summer is coming out and complain about not getting it then. Plus, the fact that the mold is reused means this Tony Stark head will fit on the Mark 42, adding more value to that figure. Bonus! 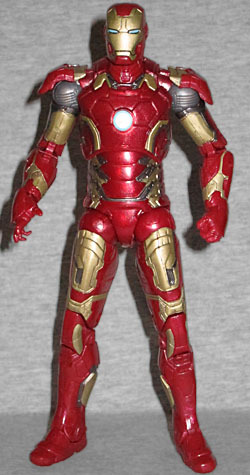 This entry was posted in blog exclusive review, Hasbro, Marvel and tagged Avengers, Iron Man, Marvel Legends. Bookmark the permalink. There's a part of me that wants to drill out the Tony Stark head so that I have an empty helmet prop. I mean, I won't, because that would be insane, but man, that'd be neat.